The third of Jonathan's screen cast on the Mashup Server is now out. This edition focuses on Service Composition using the WSO2 Mashup Server. It shows how easy it is to compose services as well as demonstrates the use of E4X constructs when writing mashups. I will be conducting a half-day tutorial titled "Server-Side Mashups for enterprise SOA" at the 9th International Information Technology Conference (IITC 2008) on the 30th at the University of Colombo School of Computing. This will be a beginner level tutorial where I will talk of how the WSO2 Mashup Server can be used as an enterprise integration tool. In the previous screencast Jonathan explained how you could get started with the Mashup Server with a simple Hello World Mashup. Now the second in this series of Screencast is out. In this screencast Jonathan explains how you could scrape a web page and make that information available to tour mashup. There is a whole load of information available on the web that is not accessible via an API and screen scraping can be used to get that information into your mashups. You could view the Hi-Resolution version of this if you have good bandwidth. SOA promises unlimited agility and organizational flexibility with a new layer of services breaking out all existing application silos. As many businesses move ahead with SOA, identity management needs to be made available as a service in the architecture in a consistent and reusable way across all applications. Prabath Siriwardena who leads the WSO2 Identity Solution team talks about how Identity can be thought of as a Service. 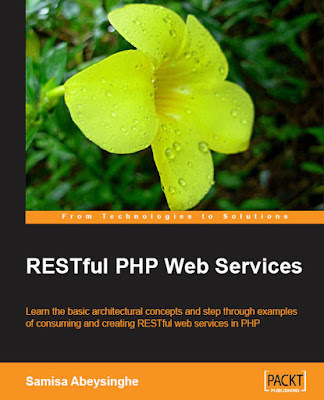 Samisa Abeysinghe's book "RESTful PHP Web Services" is now available for Purchase. Learn the basic architectural concepts and step through examples of consuming and creating RESTful web services in PHP. The book explains the basic concepts associated with the REST architectural style, but the emphasis is on creating PHP code for consuming and creating RESTful services in PHP. There is plenty of example PHP code to illustrate the concepts, with careful explanations of how the code works. This book targets PHP developers who want to build or make use of RESTful web services, or explore the options available to them in PHP. You will need to know the basics of PHP development, but no knowledge of REST is assumed, nor any knowledge of creating web services generally. The book also contains a dedicated appendix chapter on using WSO2 WSF/PHP. How true this is. I'm sure even you would have experienced this at some time or another. "Sleep seems to nail down the information we have and reorganize the way it is stored in the brain," Prof Stickgold added. Which perhaps explains why sleeping on a problem often provides the best solution. Channa has composed a nice little Quick Start Guide for the Mashup Server. It shows how you could get started by installing it and provisioning it and the later section cover how you could get data from a external web page using the scraper tool, how you could access a external web service using a generated stub and how you could read in a feed using the FeedReader. Its a nice little pack that gets you started off pretty quick. Earlier today India completed a crushing victory against Australia in the second Test. India dominated this test match from day 1 and did not let the Aussies have a sniff. Notably Anil Kumble (India's Test captain) did not take the field in the second test due to injury and it was Mahendra Singh Dhoni who led India in his place. Kumble's replacement in this test was Amit Mishra who infact made his debut in this test. The young mans performance was outstanding and he was a key reason for Australia's first innings failure. In contrast the man he replaced went wicketless in the first Test, and the media was calling for his retirement. In my view Mishra's success in the second test plus Kumble's failure in the first could mean curtains for the international career of Kumble. Let me make no mistake Kumble had his times and in fact he is India's most successful spinner. with a test best of 10/74 Kumble has taken over 600 test sticks. But every good thing has got to come to an end and I feel that Kumbles good times are drawing to a end. Sanjiva has written an excellent blog asking India to stay away from interfering with Sri Lankas war against the LTTE. Let me add a bit more to what Sanjiva had to say. If the politicians in Tamil Nadu are so worried about the innocent Tamils that are been trapped by the LTTE, why don't they pressurize the LTTE asking them to let go of the innocent civilians? The truth of the matter is that the LTTE is holding civilians in the north as a battle shield. What that would do is just delay the inevitable rather than stop it from happening. Why is the so called INTERNATIONAL COMMUNITY keeping there eyes shut on this? Why don't they come forward and pressurize the LTTE to let go of innocent Tamil civilians? Are they just worried about the LTTE and not the innocent Tamils? One of the features of Apache Synapse and the WSO2 ESB (Which is Apache Synapse + Monitoring + Management + WSO2 Registry Integration) is that it can change message formats. This article by Deepal explains how you could embed Axis2 into a Existing Web Application. Its pretty straight forward and simple. Its a good resource for anyone who is trying to expose web services out of an existing web app. One of the key features of the WSO2 ESB (Enterprise Service Bus) are Proxy Services. This post explains how you could use the proxy services feature in the WSO2 ESB to create Mock Services. These services could offer a REST interface as well as a SOAP interface. "In the initial deployment, the WSO2 data services technology was able to access the database and convert data into a SOAP message in "literally two minutes," according to Svee. During a training session with WSO2, the Concur team used the "WSO2 ESB to replicate a data synchronization system in three hours that the group had previously taken three weeks to build in Java."" Apache Axis2 supports sending (and receiving) requests over GET, POST, PUT and DELETE. This can be done by setting the "Constants.Configuration.HTTP_METHOD" property on the options object. If the HTTP Method is not set explicitly then it defaults to POST. Most often that not when changing the HTTP Method you may want to change the serialization format as well. This can be done by setting the "Constants.Configuration.MESSAGE_TYPE" property on the options object (You can change the Serialization format even without changing the HTTP Method. For e.g Send a POX message via POST). The following code Snippet shows how to send a message as "application/x-www-form-urlencoded" over GET. This is the simplest method of adding a header. But this method restricts you to simple String headers. Users are expected to create the complete header themselves using Axiom's OMElement APIs. Users are expected to create the header using Axiom's SOAP APIs. Users could use the API to set various options on the header such as the MustUnderstand Attribute. This utility method that comes with Axiom takes in a String as the argument and returns an OMElement. This method could be used to add multiple headers to the response message. This also should how a service could get hold of the response message context. Sigiriya (which means Lions Rock) which is a ancient rock fortress built by King Kasyapa (477 – 495 AD) is located in the central part of Sri Lanka. Some people even call it the Eigth Wonder of the World, its that amazing. If you are traveling to Sri Lanka its a place that you must visit. Ruwan Janapriya (A colleague of mine at WSO2) who is a great photographer has created some stunning Panoramas of of Sigiriya. There are several of them taken at various locations, some cover the beautiful paintings (frescos) of Sigiriya as well. One of Ruwan Janapriyas Panoramas has been selected for the World Wide Panorama event 2008. Thats how good he is in ﻿Panography. The http.nonProxyHosts can be set to specify the hosts which should be connected to directly (not through the proxy server). The value of the http.nonProxyHosts property can be a list of hosts, each separated by | (the pipe character). It can also take a regular expression for matches for example: *.sfbay.sun.com would match any fully qualified hostname in the sfbay domain. For more information you could refer http://java.sun.com/features/2002/11/hilevel_network.html. If you need to call a service which is protected using HTTP Basic Authentication with Apache Axis2, then you could do so by setting the following property on the options object. This is a question asked regularly on the axis-user list. "Code generated by the wsdl2java tool is hard to use. Is there any better way that I can generate code?". The answer to this is that you could actually use wsdl2java to generate better code. Lets take an example scenario. For this I will be using a Service that I have deployed on Mooshup.com. This simple service has a operation called demo which accepts three parameters (firstParam, secondParam and thirdParam). I will be using the wsdl of this service for explanation. Lets first try to use wsdl2java on this wsdl and see what happens and how -uw can help. Now what is more elegant and easier? Its a easy answer. Most users are not aware of the set of options that wsdl2java offer (Will cover that in another post). I am currently employed at WSO2 where I work as a Senior Software Engineer contributing to the success of WSO2 and the WSO2 Mashup Server. I'm also an Apache Axis2 commiter and is heavily involved in developing WSDL 2.0 and REST support in Axis2.